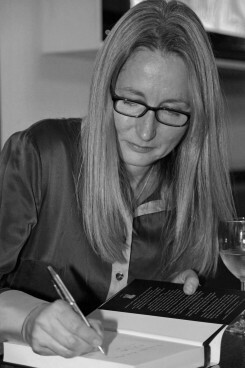 SD Sykes writes historical crime thrillers, set in the 1350s. 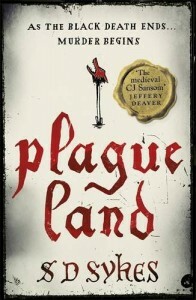 Published by Hodder & Stoughton, her first novel in the Somershill series, Plague Land (Sept 2014) takes place in the aftermath of the Black Death, as the young & inexperienced Oswald de Lacy attempts to stop the killer who is terrorizing his estate in Kent. 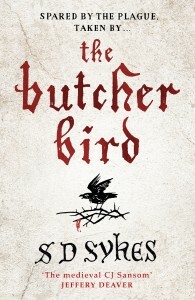 Her second Somershill novel, The Butcher Bird (Oct 2015) follows Oswald to medieval London, to solve another murder mystery, and resolves a dark secret of that has menaced his family. She is currently writing her third in the series, which sees Oswald travelling to 14th century Venice. Having studied for an MA in Writing from Sheffield Hallam, SD Sykes has written for radio, and has developed screenplays with Arts Council funding. In Spring 2012, she finished her first novel Plague Land after attending the novel writing course at literary agents Curtis Brown.